Last Updated: March 19, 2019 · Published: February 12, 2018 By: Asian Caucasian 10 Comments This post may contain affiliate links or sponsored content. 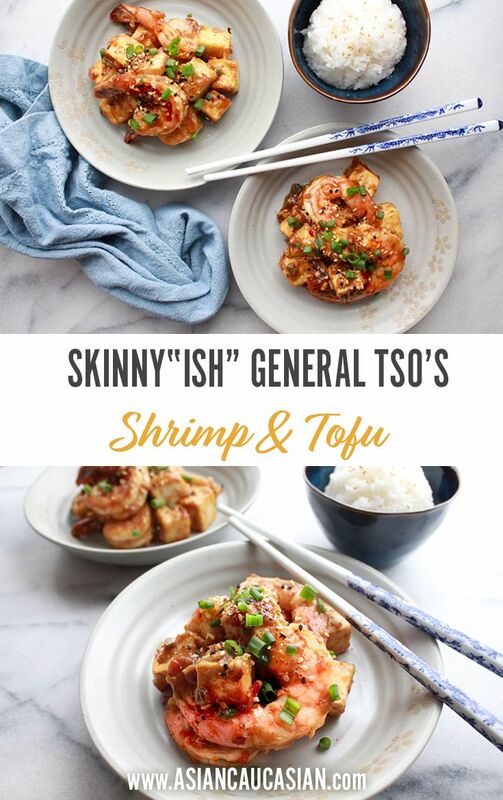 Getting ready to celebrate the “Year of the Dog!” The Chinese New Year is this week and we’ve dished up a lighter version of General Tso’s classic recipe — our Skinnyish General Tso’s Shrimp and Tofu! Still full of amazing flavor, this lower-fat version is not battered and deep fried, but stir-fried with our special sweet and spicy sauce. No chicken either in this recipe, which is the classic Chinese version (always trying to change history, LOL!). The cornstarch gives the sauce a nice thickness without weighing it down. So many flavor bombs in this sauce like garlic, ginger, and red pepper flakes that compliment the shrimp and tofu so well. 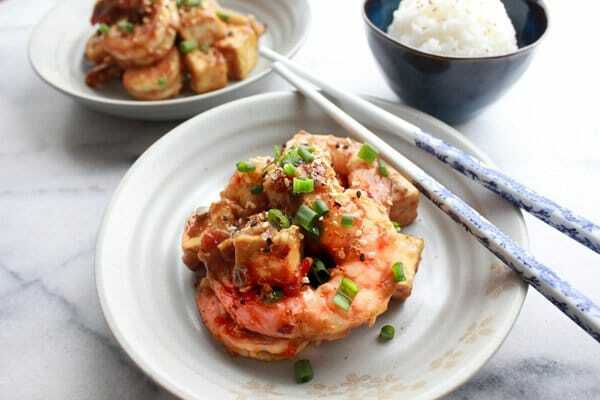 You can use whatever protein floats your boat in this dish, but we’re obsessed with the shrimp and tofu combo, so that’s the “skinny” on this one! 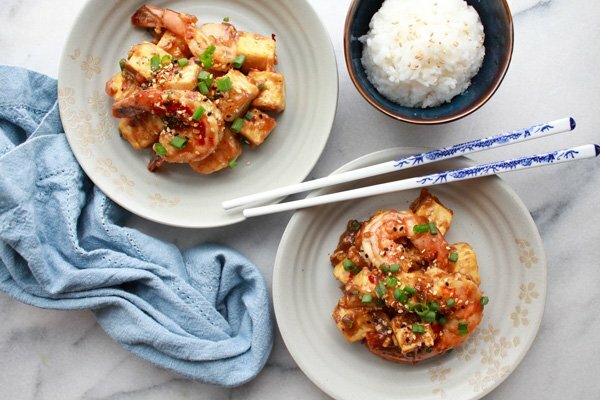 Our skinnyish version of General Tso’s Shrimp and Tofu is a flavor bomb in your mouth! But, you’ll never know it’s lighter on the calories. There’s no battered and deep-frying in this dish! The key to getting tofu that gorgeous golden brown is to remove all of the moisture first by wrapping the tofu block in a kitchen towel or paper towels. Then, cube them up! First, stir-fry the tofu cubes until golden brown. Throw in the shrimp and stir-fry until partially cooked through. 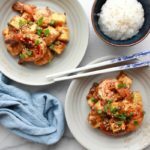 Celebrate the Chinese New Year with this gorgeous, lower-fat General Tso’s Shrimp and Tofu dish! It’s perfect for the family or impressive to serve for your guests. 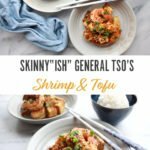 We’ve dished up a lighter version of General Tso’s classic recipe — our Skinnyish General Tso’s Shrimp and Tofu! 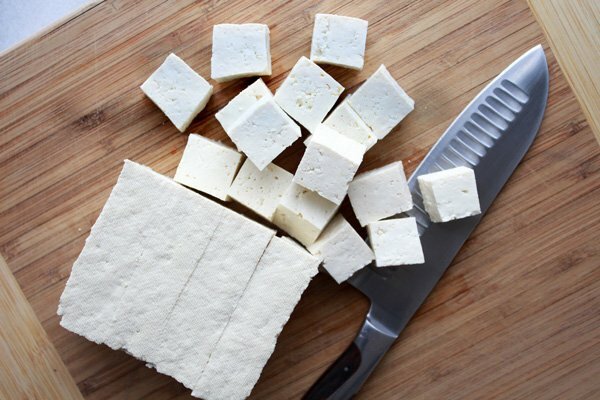 Wrap the tofu block with a kitchen towel or paper towels to thoroughly remove moisture. Let sit for 30 minutes. Cut the tofu into even ¾-inch cubes. Peel and devein the shrimp and set both the tofu and shrimp aside. To make the sauce: In a small mixing bowl whisk together soy sauce, rice vinegar, hoison sauce, water, brown sugar, and corn starch until well-combined and not lumpy. Stir in the chopped green onions and set aside. Heat the canola oil in a heavy wok over medium-high heat. Stir-fry the tofu until lightly browned on all sides. Add in the shrimp and partially cook, about 1 minute. Toss with salt and pepper and remove from the wok in a bowl and set aside. Add the garlic and ginger to the wok over medium-high heat. Sauté until fragrant. Toss with the red pepper flakes. Pour in the sauce and cook over low heat until it starts to thicken. (Add in more water if sauce gets too thick.) Toss together with the shrimp and tofu, coating well with the sauce. Cover for 1 minute until shrimp is cooked through. Garnish with chopped green onions and sesame seeds, and serve with a side of rice if desired. 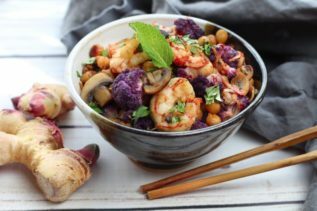 If you liked this recipe, try our Shrimp Sambal with Roasted Cauliflower. General Tso is one of my favorite recipes, need to try your way with tofu and shrimps, sounds exquisite! Thank you so much, Patty! 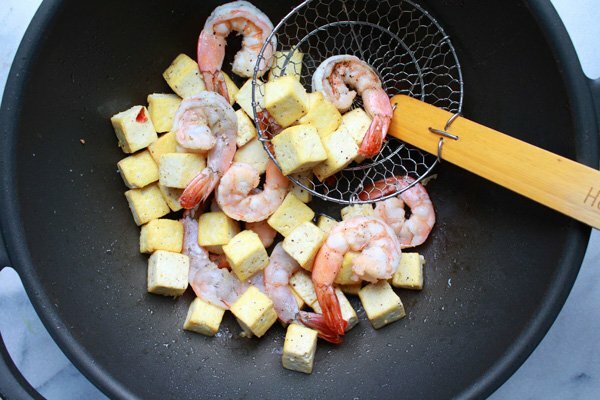 I love the combo of shrimp and tofu! This is not as heavy as the traditional General Tso’s but just as yummy! Could no agree more! I always add extra garlic to recipes. Thanks, Lizet! I love the sound of this, such great flavour combinations. The addition of tofu is genius. I love tofu, so just had to include it in this recipe! Thank you! Looks tasty, I like that you’ve made it lighter but still with plenty flavor. Thanks, Caroline! You would never know it’s less calories! No compromise on flavor whatsoever! I’m loving the combo of tofu and shrimp. Such a quick and delicious dinner! Thank you, Amanda! This recipe is a keeper and one for the entire family!